In 1938 Anne Mary Barilla entered the Grand Rapids Dominican Community, where she joined her two Dominican Sisters, Sisters Elizabeth and Juliana. Anne Mary was received into the Order one year later and given the name of Sister Stephen; she made her first vows in August 1940. As a food service director Sister’s first mission was St. Mary Convent in Carson City. Later she served our Sisters at various missions including St. Mary Magdalen Convent in Melvindale and Holy Rosary Academy in Bay City. From 1944 to 1950 Sister Stephen was missioned at St. Joseph Seminary where, through her contacts with the seminarians, she was indirectly instrumental in the formation of many future priests. Later she was at St. Alfred’s Convent in Taylor (from 1953 to 1957), at Sacred Heart Convent in Muskegon Heights until 1963, and finally at Sacred Heart Convent in Saginaw until 1970, at which time she went to Esterhazy in Saskatchewan to help her parents who were both ill.
News of Sister Stephen’s death was a shock to all. 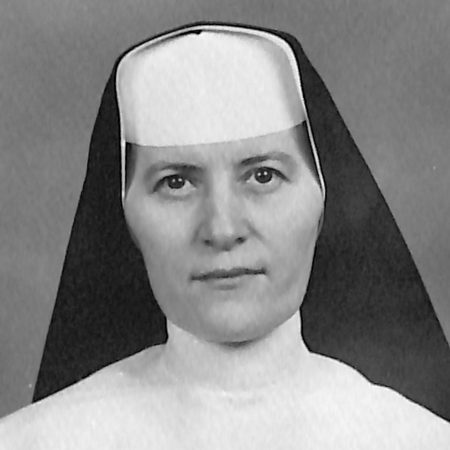 On Friday, March 25, 1971, Sister Stephen had visited her sister, Sister Blonda, a Sister of Social Service, and was returning to her parents’ home in Esterhazy. She was travelling in the car of Mr. Anthony Nicholas, choir master in Esterhazy and a friend of the family. Also making the trip were Mrs. Linda DeWar, an eighteen-year old expectant mother, and three university students. They left Regina between 4:00 and 5:00 p.m. on this cold clear day. As they were going along the Trans-Canadian Highway and approaching Indian Head, the halfway mark on their journey, a storm arose. They stopped at a coffee shop while considering the feasibility of staying in town for the night. However, since to all appearances the storm had subsided they agreed to continue to Esterhazy. For about 15 miles all was clear, but then another storm came up and the roads became icy. From the opposite direction they could see a swerving car gliding, but before they realized what was happening it had collided into them. The first to come upon the scene of the accident was a salesman from Manitoba who notified the Mounties and gathered blankets from the neighboring farms to keep the injured warm. By this time the storm was raging, and the first contingent of Mounties landed in a ditch before they were able to reach the scene of the accident. When the ambulance arrived, Sister Stephen and Linda DeWar were the first to be rushed to a nearby hospital in Wolseley since they were the most critical. From there they were taken to Regina General Hospital where Sister Stephen, who had suffered a concussion and fractures of both legs, was immediately cared for. Members of the immediate family and friends kept vigil all night, hoping and praying that Sister would regain consciousness for even a few moments, but to all appearances Sister never realized they were with her. In Michigan Sister Elizabeth and Sister Juliana waited in anguish and stunned disbelief. The next morning, Saturday, the call came: Sister Stephen had passed. Sister Stephen was born March 16, 1919, on a farm north of Grayson, Saskatchewan. She was in the middle in a family of eleven children. As a child she was delicate. As she grew older she became stronger and healthier and she was a lively, vivacious person who made friends easily and was quite popular. She was quite an arbitrator and peace-maker and a great baby-sitter, not only for the younger brothers and sisters, but for cousins and neighbors. If there was an argument she would listen to all the complaints and then come up with a decision that was satisfactory to both sides. Sister Stephen had great devotion to the Rosary. In her Office Book that was still in her hands when she was admitted to Regina General Hospital, she had little leaflets and aids to meditation on the Rosary. Her other great devotion was to pray for priests. Sister Stephen made a Pentecostal Retreat at Marywood and this created a deep impression in her. She attended several prayer meetings at St. Mary’s and at Marywood. She asked to be prayed over for the baptism of the Holy Spirit. We had barely begun to pray when she joined us praying and singing in tongues. It was the power of the Spirit that transformed her life and gave her the strength and courage “to die to self” that was so evident last summer and fall. Into your hands we commend our love. How frequently we heard Sister Stephen sing this favorite of hers as she went about her daily work. Daddy told us she was radiantly happy the last few months before her death. She was always singing, smiling, laughing. Others in town noted her joyous spirit. People we hardly knew came up to tell us how much good her presence did in Esterhazy during her several months’ sojourn. She brought together people who were estranged. She cheered the hearts of lonely widows and brought back to the Church a young woman. The funeral of Sister Stephen was a very large one, filled with the joy of the resurrection and a deep faith. It was a beautiful sunny spring day on March 30. Signs of spring, growth, life were present – life, eternal life. May eternal life and joy be yours, Sister Stephen. Entered eternal life on March 27, 1971 at the age of 52 after 32 years of religious life. We commend Sister Stephen to your prayers.